If you are looking for a unique bridal necklace to complement a low neckline or strapless wedding gown, look no further than this Crystal and White Pearl Dangle Wedding Necklace. Bold, beautiful, and bursting with natural radiance, it guarantees to add more than a little sparkle to your wedding day, and every special occasion thereafter. 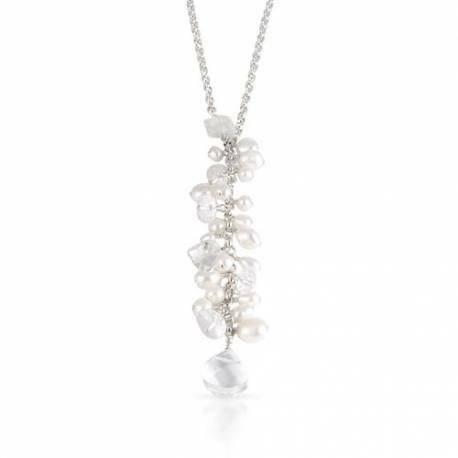 Handcrafted, this Crystal and Pearl Wedding Necklace features a classic sterling silver link chain with a lobster clasp fastener, and a cascade of luminous freshwater pearls and hand carved rock crystals that shine resplendently on the décolleté. Coordinate with the matching earrings for a show-stopping wedding day look. Sterling silver with freshwater pearls and rock crystal.